My Chart - Any Interpreters? Let me know what information you get out of it ..
donaqua, what would you like to know in particular? donaqua , what would you like to know in particular? For example what would be the most suitable career path? From your chart donaqua, it looks like you would prefer a job which allows you to be your own boss. With your MC ruler in the 4th house; perhaps a job close to your home in actually in your home. Your Moon in 10th house means you are well received in public; but with your Sun in the 4th house; I suspect you feel a push/pull effect between feelings of being in the public eye and having privacy. With the Leo MC/Aqua Sun; maybe you would like to teach something scientific? Do you like to perform? Or do you prefer to give one on one classes? These are just spectulations. Perhaps tell what your current job is or what you have done in the past? From your chart donaqua , it looks like you would prefer a job which allows you to be your own boss. With your MC ruler in the 4th house; perhaps a job close to your home in actually in your home. Your Moon in 10th house means you are well received in public; but with your Sun in the 4th house; I suspect you feel a push/pull effect between feelings of being in the public eye and having privacy. Yes you are spot on, in home environment i feel most productive and best. Sun is actually 2 degrees Pisces, so perhaps something Spiritual, im into religion and spirituality etc. I dont like to perform that much, more of a one on one type of person. Well i've been on and off in building, in sales, part time Uber driver. At the moment im in a job seeking period but was thinking about taking a IT course and develope myself in that area.. I have Sun sextile Uranus so Aquarius things interest me as well but in the backround. donaqua, perhaps that would be a good idea. We have a stellium of Capricorn coming which would be around your 3rd houses; good time to learn! Your chart is quite like mine in some ways. Our ascendants are close; your Moon in Leo is conjunct my Leo Mars; your Taurus Mars is conjunct my Taurus Sun haha. sven555 sorry for the delayed reply, been away for a while. Yea there are similarities. 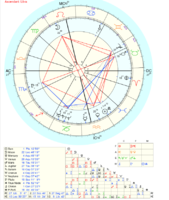 Pluto in the first house, brings depth and etc. No worries mate, nice to see you back. How have you got on since we last spoke? sven555 yea good man, as you said stellium is working in a sense that i'm developing myself in new areas in career wise.